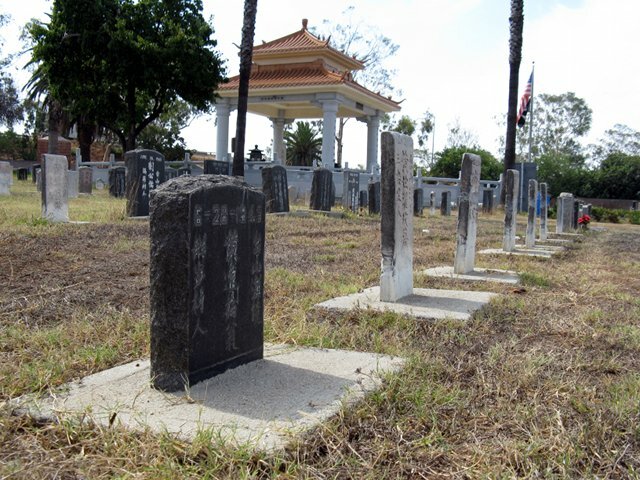 The Chinese burial ground, which is situated in East Los Angeles, was built in 1922. Each grave in this burial ground has a place with a Chinese family. This demonstrates to the overall population of East Los Angeles that Latinos weren’t the main race that dwelled in East Los Angeles. Moreover, this graveyard is the first settled for Chinese outsiders in Los Angeles. As of today, this memorial park stands emphatically for a long time although many graves are overlooked and the eventual fate of this burial ground are thin; it makes a solid image of East Los Angeles by demonstrating to public that we acknowledge different diversities in our group and it demonstrates to the people in general that we coexist with different races. The moment you take a step into this Chinese cemetery, it feels as if you have enter ancient burial grounds from China. The tome stones look as if they were made for the kings and wealthy people of China. At every turn you see Chinese scripts and artifacts. The tome stones and artifacts almost look as if they belong in an ancient museum of art. You almost feel as if you’re in ancient ruins, in a different location of East Los Angeles. You can hear nothing but the cars passing through the 710 highway for it is a sacred place for families and friends to visit lost cherish ones. This cemetery gives a personal insight of how the Chinese establish their graves. This burial ground is valuable because it shows the culture of the Chinese people and the diversities in East Los Angeles. It also gives value to my community because it’s almost like a museum of Chinese art. This burial ground has affected the community since it’s been set up for just about a century and gives a place for lost friends and family to go visit their lost loved ones. Numerous Chinese relatives would get the chance to accumulate or visit their lost friends and family, and still do as such today. On the off-chance that this cemetery would be decreased, it would influence the Chinese families as well as the community too. Various Chinese migrant families would be extremely furious if this cemetery were to be diminished. The grounds that their cherished one has been covered there for a long time won’t have a place to visit their friends and family. It will make the community look savage, crushing family’s only holy place of appearance. There is a possibility of this burial ground to be stifled to extend the 710 interstate right above it. This demonstration will make the entire group look awful, as if they couldn’t care less or acknowledge different diversities in their group; it will make the group look egotistical and predominant. This burial ground is essential to the way of life of East Los Angeles in light of the fact that it demonstrates the historical backdrop of East L.A. by exhibiting to people in general that different races once lived here in East L.A.